Wolfgang Amadeus Mozart’s music is timeless, but Mozart the man had a sadly short time on Earth. In his 35 years of life, he exhibited a disdain for authority that manifested itself in his familial and professional relationships, and most memorably in his operas. Indeed, Mozart’s resistance to authority led to one of his less recognized impacts: a lasting change in composing as an occupation and music as an industry. It’s difficult to pinpoint what makes Wolfgang Amadeus Mozart so special, and most people have their own reaction to the legendary composer’s life and music. His status and influence were not, however, accidental. One of his most important and yet most overlooked accomplishments was how permanently he changed composing as an occupation and music as an industry. Mozart is known, first and foremost, as a great composer. This might be an understatement. He is undoubtedly one of the most famous and celebrated composers ever to grace the ears of the world, but this view lacks a full appreciation of the nuances of Mozart’s actual life. Studying him through his music gives us the context to his life as a composer, but studying the history of the time and place in which he lived provides the context to his life as a person. Mozart was deeply affected by the shifting political, social, and philosophical landscape of his time, and it shows in the subversive notes of his music and actions. At 17 years of age, Mozart was already a seasoned artist and was hired as the court composer for the Archbishop of Salzburg. This would lead inevitably to the feuds Mozart had with two of the most imposing authority figures in his life: the Archbishop, who would hamper and trouble Mozart for years after, until his final resignation from the court; and his father Leopold, the controlling tyrant of the young genius. These struggles would lead to major issues for Mozart at his Salzburg post and in his relationship with his father. The expectations of the Archbishop limited the scope of his compositions. With a wide variety of commissions at court – such as dances, symphonies, and quartets – he could not pursue what he passionately wanted to do: compose opera. This dilemma, coupled with the almost embarrassingly low pay he received there, compelled Mozart to do something reasonable and yet, somehow, unexpected: he quit. The decision to leave the court was bold, but it would be only the beginning of his quarrel with the Archbishop. The decisive action would also be among the first of many arguments with his father. But it also led to a near-revolutionary breakthrough for Mozart. In the 18th century, composers generally worked for commissions provided by kings, dukes or other nobles with money to spend. The composers would either be paid to create pieces of considerable size, like requiems or symphonies, or they would receive annual salaries. Such pieces were valued by the nobility because they enhanced the reputations of the patrons as people of taste and wealth. Luckily for Mozart, however, there were other avenues of success emerging for him. Opera, while always a mainstay of music, had become an increasingly popular and profitable enterprise. More and more common people were able to pay to see it, and, as the middle class in cities like Vienna grew, so too did their appetite for musical theatre. Operas, being large scale productions, were funded by wealthier commoners, who saw great investments in the future of the medium. Mozart’s father was dead set against him earning a living by freelancing. And he was even more insistent that his son not do it in Vienna, where he could not be controlled. For his part, the Archbishop continued to block Mozart’s attempts to work outside the established confines of the court, from which he had left, returned, and then attempted to leave again. Mozart had become a strange phenomenon: he was the most rebellious composer in Europe. Mozart’s undermining of convention had only just begun, however. Publicly, he was controversial because he was an artist of monumental genius who was childish in his demeanor and the ways he spent his money. His public image, though, paled in comparison to the controversies found with his works – in particular, two of his most famous and profound operas, The Marriage of Figaro and Don Giovanni. Both can be considered Enlightenment era pieces, influenced by and containing themes pertinent to the period, such as the role of aristocracy and sexual liberty. 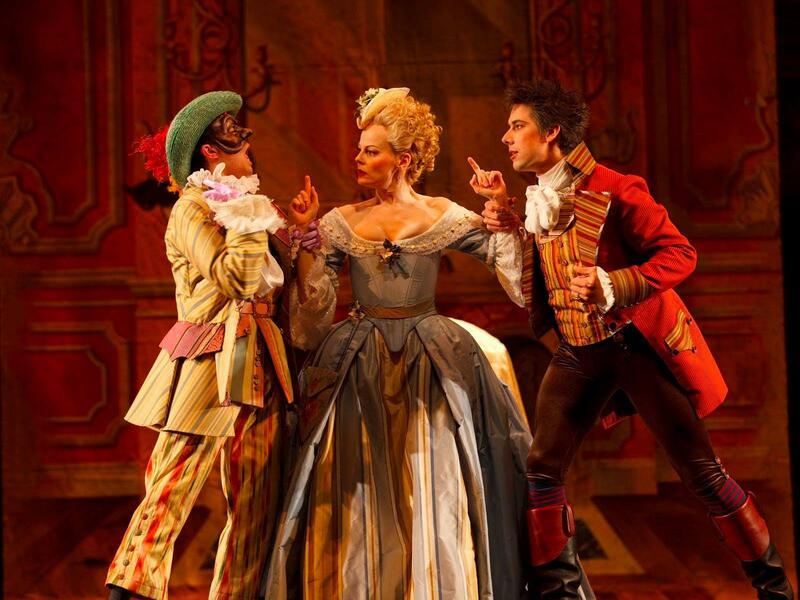 Mozart's "The Marriage of Figaro" is still performed around the world to this day. Both operas criticize aristocracy heavily, perhaps unsurprisingly when one considers the context they were written in. The decade of the 1780s rests almost perfectly between the American and French Revolutions. These unprecedented rebellions overturned the political hierarchy of their respective societies. No longer would the people submit to the rule of the nobility or upper class. Both Figaro and Don Giovanni call out nobles who abuse their power, and feature common people who suffer and eventually triumph despite their oppressors. Even with all his criticism of those in power, it is tempting to say that Mozart’s work still had not undermined or subverted any real authority. After all, great thinkers like Rousseau and Locke had been laying the foundations for the political atmosphere of the time for some years by this time. However, there is a special difference between the writings of enlightenment philosophers and the operas of Mozart. Publishing authors like Rousseau could risk severe punishment by authorities, whereas The Marriage of Figaro was commissioned by and performed for Emperor Joseph II of Austria. To stage an opera, even censored as it was, and still declare authority as flawed – and to do so right under the nose of the emperor – was a skillful way to flip off every oppressive figure in Mozart’s life. The sexual and romantic relationships in these operas convey a similar message. The antagonists of the two operas, Don Giovanni and Count Almaviva, chase women whom they know are betrothed to other men and regularly abuse pretty much everybody of lower class than themselves. The important thematic distinction, however, comes toward the end of the operas. Don Giovanni, unrepentant and defiant in the face of his certain doom, is pulled to Hell. In The Marriage of Figaro, however, the Count makes up with his own wife, allowing the marriage to proceed and a veritable “happily ever after” at the conclusion. The intended audience of these two operas can be interpreted as any group of people, depending upon what aspect of each you choose to analyze. The operas represent the people of the working class, people who, like Mozart, must thrive under whatever conditions prevail, favorable or otherwise. They also declare certain freedoms from tyranny, saying to benevolent kings and oppressive emperors alike what many had been thinking for a long time, “No more!” The starkly contrasting outcomes of the two operas testify to this. Mozart sets an example of what can happen to those in power once they’ve pushed their limits too far: repentance and a second chance, or literal damnation to Hell. Don’t be fooled by the giggling idiot version of Mozart as portrayed in the popular 1984 film, Amadeus. The man was no fool (immature maybe, but not stupid). He understood the power of art to influence the opinions of the public and knew that the political winds of his time were shifting. His works, and especially his operas, are records of the changing and enlightened thinking of the era.